What’s the best gift you can give someone that loves fishing? More fishing of course! 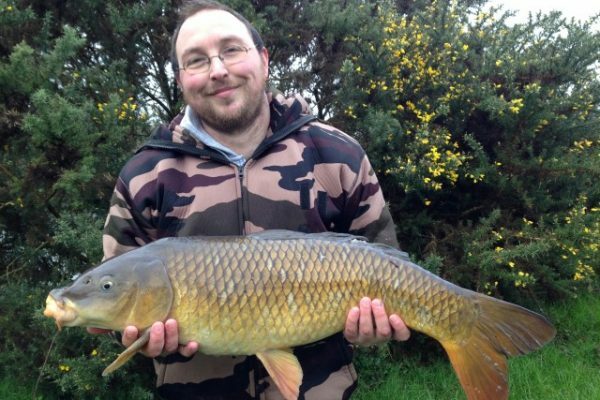 And that’s exactly what Naomi bought for her partner and his mates this Christmas, a winter Carp fishing lesson. 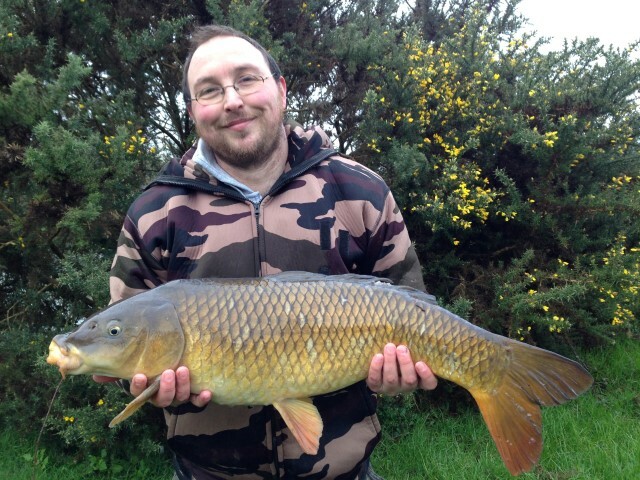 The group had recently got into their fishing and were finding their way into the world of carp fishing and have enjoyed some success. 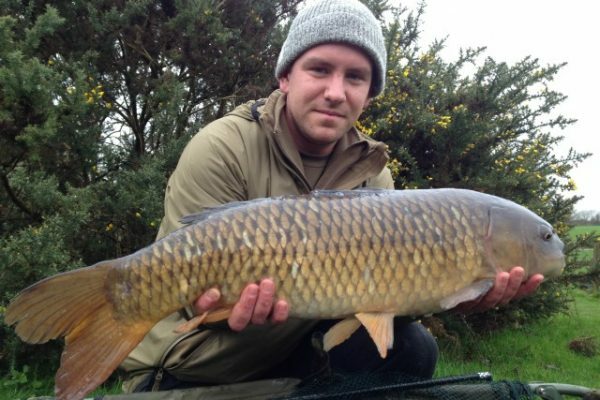 However recent winter trips had seen a few blanks creeping in. No shame in that, winter carp fishing can be very testing and it’s for that reason we don’t do many carp fishing lessons at The School Of Fish. However, these guys were all super keen and the relatively mild Cornish winters mean we can normally find a bite or two with careful selection of fishery and fishing methods. On arrival the weather was just about perfect. Temperatures just into double figures, a westerly breeze and overcast cloud, everything you should hope for. The session would focus on fish location and observation, rigs and bait, playing and landing fish, hook removal and fish care and finally, taking a great photo. The day’s biggest lesson would prove the be the first one, fish location. It’s what most anglers pay least attention to favouring instead to chose the latest rig and super-dooper fish can’t refuse it wonder bait. But if the fish aren’t in front of you, you simple won’t catch them. The best item of fishing tackle I own is a pair of polarised sun glasses. Even in dull conditions and in muddy water, they are still a vital tool for location fish or at least signs of feeding fish. We completed a lap of the lake and found two shoals of fish just under the surface and several small areas where a change in the water colour gave away the presence of feeding fish. Where carp feed on the bottom they will disturb the bottom sediment. This will drift up in the water and can generally been seen as an area of different coloured water. We started our session focussed on the fish bear the surface. Surface fishing is normally associated with summer fishing but these fish were keen so we adapted to the opportunity and targeted them with a free lined floating bait. 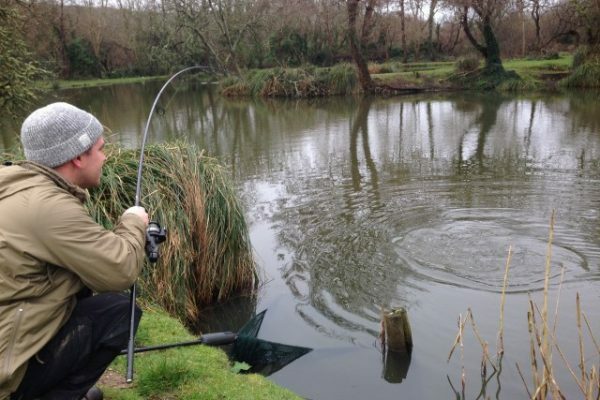 Armed with the rod, Graham who’d not caught a fish on several recent trips crept into position remaining low so as not to spook the feeding fish. After a couple of near misses he soon struck into a fish which gave him a solid scrap on the lightweight and balanced fishing tackle. With the fish soon in the net then placed on the unhooking mat, the hook was removed, fish care Klinic applied and Graham posed for a photo with all 14lbs of his stunning common carp. A superb way to start the day that got the lads itching for a go themselves. Two more fish of a similar size (although Graham would I’m sure like to point out his was still the biggest) followed for Liam and Alex. Jay also hooked another fish soon after but unfortunately it found a hidden snag and slipped the hook. 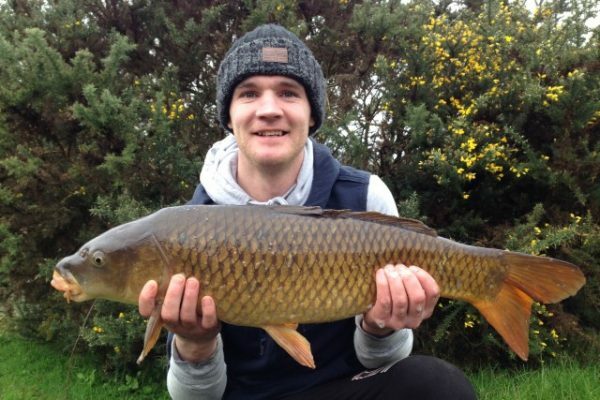 The pace of fishing inevitably dropped away after the initial hectic start but during the course of the day, another three fish were landed taking the tally to six fish all of which were double figures. During the day we looked at a variety of rigs and how to tie you own rather than buying shop bought ready tied options. It was whilst looking at the shop bought rigs that we checked the hook points and just how sharp they were. The first two weren’t nearly as sharp as hooks from a packet. It may seem like a small thing but getting little things like sharp hooks right will significantly improve your catch rate. Place the point of the hook gently on your thumbnail. Pull the hook slightly across your thumbnail. A sharp hook will not move. A blunted hook will slid over your nail leaving a little white scratch. If the hook skids, replace it with a sharp one. Good luck to Jay, Liam, Alex and Graham with your future fishing trips. And don’t forget the polarised glasses! If you would like to book a lesson at The School Of Fishing, check out our lessons pages. Can’t see what you want there? Email or phone on 07710685583 and we’ll see what we can do for you. Salmon Fishing in Cornwall – My first experience, and it’s a good one! How do I plumb the depth when I’m fishing?